Ghostbusters NJ is sparing no expense as we’re maxing out our Ghostbusters gold card on a fleet of ectomobiles. This way we’re always on the cutting edge of GHOSTBUSTERS technology. And look really cool while on a job. Not to mention all that free advertising that pays off. Wait, has it paid off? Inspired by the original 1959 Cadillac Ecto-1, this Ecto is built on a 1971 Oldsmobile ambulance. Equipped with all the latest in 1980s ghost sensing technology the Ecto-1B will unreliably take the GBNJ crew to where ever a ghost may be. It will seat five with room to carry all the proton packs, traps, and PKEs needed while achieving an astounding 6mpg. Excessive amounts of emergency lighting on top clears the roads for plenty of red light running. Is she photogenic or what? 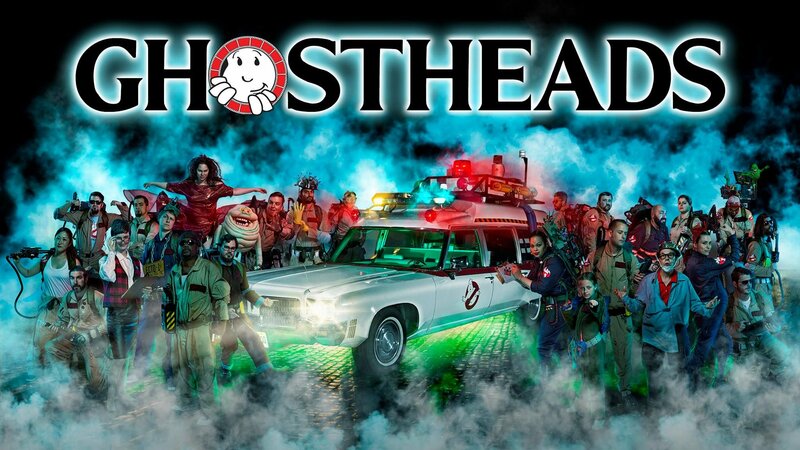 Let’s face it, a massive 1970’s ambulance is more than we need for most jobs, that is where the Ecto-1M comes in. She’s modeled after the original Ecto-1 & Ecto-1A with a modern platform and a touch of futuristic. “Zuul” is a ghost catching machine. This Dodge Magnum is equipped with the latest in paranormal catch and detaining technology. Ecto-plasm transport tanks accompanied by “Good slime” to help fight the evils on the other-side attempting to enter our plane. 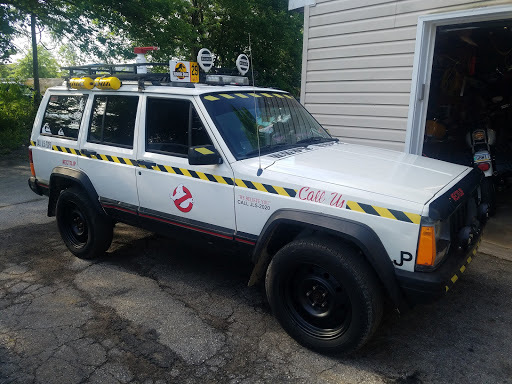 The ECTO-JP spent it’s life as a security vehicle before Jordan stole…uh… liberated it from the theme park he used to work for. 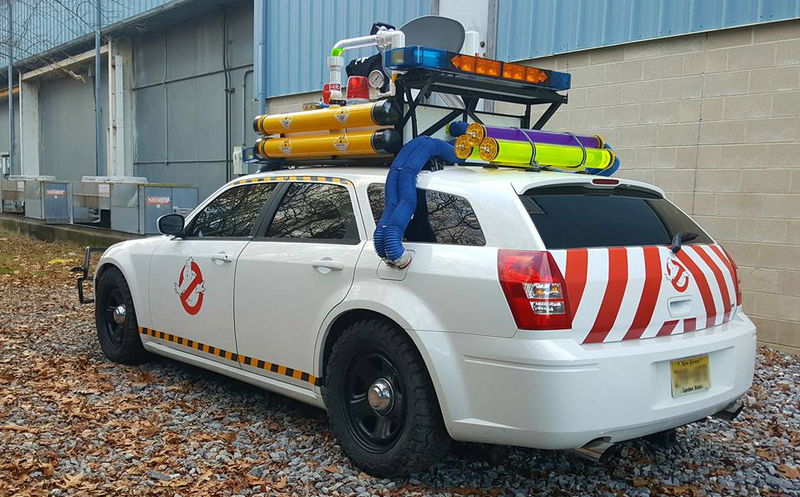 She is outfitted with all the latest Ecto-location gear and enough caution tape to make sure everyone on the road knows to give this beast a wide berth. With Jeep’s legendary off road capabilities, this makes the perfect platform for chasing down the Jersey Devil in his natural habitat, the Pine Barrens. How did you guys connect the blue pipes to the fuel cap on the Ecto-1M? I’m trying to figure out how to attach them to my own Ecto-ESX!